Karyn Kusama (The Invitation, Jennifer’s Body) is back, and she’s set her sights on the unflinching vendetta story. Her vision is as uncompromising as Nichole Kidman’s transformative performance, and her direction is the most confident it’s been since The Invitation. Streaked with elements of Noir and bathed in bright sunlight, Destroyer does for the gritty thriller what You Were Never Really Here did for the hit man film — though not as effectively. Erin Bell (Nicole Kidman) is an LAPD detective, who, as a young cop, was placed undercover with a gang in the California desert with tragic results. When the leader of that gang re-emerges many years later, she must work her way back through the remaining members and into her own history with them to finally reckon with the demons that destroyed her past. Women aren’t often presented with roles that allow them the opportunity to go to very deranged and gritty places. Normally, in films such as this, the leading role would be given to a male — someone like a De Niro or a Pacino or a Neeson — but Destroyer doesn’t conform to that particular genre convention, and that’s where it derives a bulk of its freshness. The film shares many similarities with Widows, in that they both infuse the female perspective into what is otherwise a male dominated genre with headstrong style and bold direction. Although it doesn’t go against the grain as much as Widows or You Were Never Really Here — that pretty much stops with Kidman playing the part that would typically go to a man — Destroyer’s squalid thriller/noir elements, which present no true nuance, are well handled and energetic thanks to Kusama’s unflinching and self-assured direction. It’s not the most deft or bold direction of the year, but it’s smooth and sleek in its own way. In particular, the use of sunlight and overexposed brightness is a nice choice for a story as dark and morally askew as this. The film’s major defects are mainly script and editing related, and both give it an uneven structure. Often times, it feels at odds with itself; the character study drama wars with the revenge thriller portion (the former being the most engaging), and the nonlinear storyline has the tendency to further muddle things. It’s the kind of film that powers along on its own course and expects the audience to follow along, which is commendable, but some story elements, like Erin Bell’s backstory, are glossed over or mentioned in a fleeting line of dialogue, and it’s easy for the viewer to lose sight of the narrative’s trajectory and/or moving parts. The script does a good job of making Erin into a complex character though, one that the audience is able to empathize with and root for, despite her despicable behavior. Although, this is more so a testament to Kidman, as she disappears into the innermost recesses of the role and emerges totally transformed; her voice is grizzled, she moves with a hobble, and thanks to the phenomenal make-up effects from Bill Corso, she’s nearly unrecognizable. Without Kidman and Corso’s nuance and fine-tunings, Erin Bell would just be another cop operating on the outskirts of law and abusing their power for their own ends. Alongside Kidman is an ensemble cast that includes the likes of Sebastian Stan (I, Tonya, Captain America: Winter Soldier), Bradley Whitford (Billy Madison, Get Out), Tatiana Maslany (Stronger, Orphan Black), Toby Kebbell (Dawn of the Planet of the Apes, RocknRolla), Scoot McNairy (Killing Them Softly, Argo), and Jade Pettyjohn. Stan plays Erin Bell’s undercover parter and love interest, and he continues to prove that he’s much more than a Marvel plaything. He gives the film a warmth and is able to covey a lot with just a look. Whitford and Maslany are both fantastic, and they nearly steal the show from Kidman whenever they pop up on screen. Kebbell is a weakly drawn character and isn’t given enough screen time to be an effective villain. Pettyjohn plays Erin Bell’s daughter, and their rocky relationship is the most compelling portion of this disjointed narrative. There is one scene in the third act — a conversation between Pettyjohn and Kidman — that, for me, was the best bit in the entire film because it hit on some emotionality that seemed to be lacking and also provided context into the film’s close. 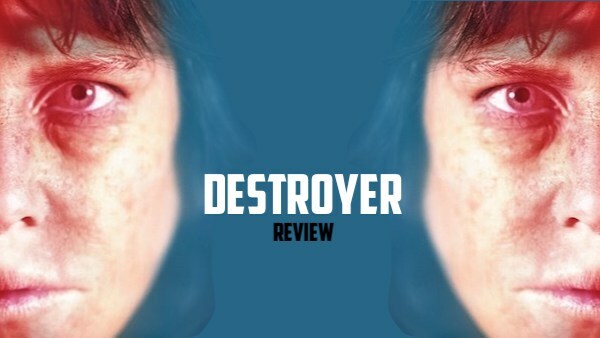 Destroyer has a lethargic pace, complete with the stoner metal attitude to match and a hesher heart, which may be a snooze for some. The first half especially has the potential to be a bit of a chore; however, the latter portion is laced with a bit more action and emotion — at about the midway point there’s a very well executed cops and robbers shootout that keeps the blood pumping. Ultimately, its conclusion lacks the punch and catharsis you’d expect a revenge thriller to provide, but it gives you a little something to chew on for the drive home. Recommendation: Kusama and Kidman fans definitely get on this. Fans of the revenge thriller should also give this a day in court, as they may be surprised with what they get. Rating: 3.5 tired eyes outta 5. What do you think? Are you stoked for Destroyer? We want to know. Share your thoughts and feelings in the comments section below, and as always, remember to viddy well!